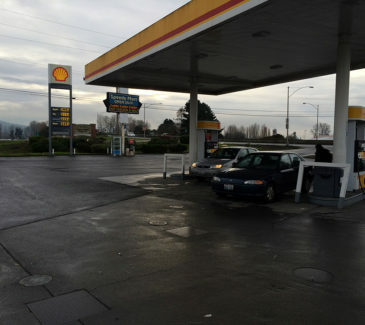 AEC bid this project to the Speedy Mart owner to install all new fuel dispensers, fuel islands and drive slabs on the site, as well as performing the installation of new turbine sumps, dispenser sumps, canopy and double-wall piping. The AEC crew began by installing a 6’ high security fence around the project area, followed by the removal of ten (10) LED canopy lights intended for re-use, and subsequent demolition of the existing canopy. 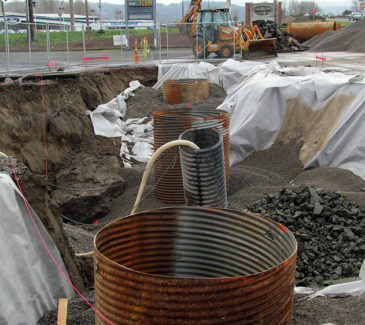 An 18’ x 31’ x 9” section of tank slab was removed in order to access the three turbines, and AEC installed the new turbine sumps and double-wall piping, as required by Ecology regulations. 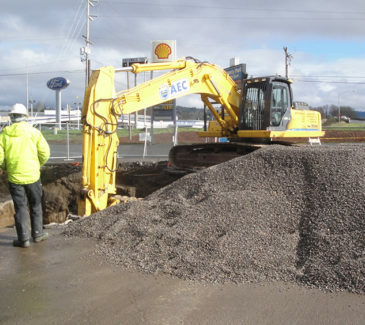 Petroleum contaminated soil (PCS) was discovered during the performance of the project and AEC crews managed the safe removal and disposal of the contaminated materials before the backfill and compaction of over 600 tons of clean soil. We then completed the installation of the brand new canopy, steel fuel islands and dispenser sumps, supplying and installing the electrical and pipe penetrations, impact valves, brackets and flex connectors, testing all the new piping ahead of the fire marshal inspection. 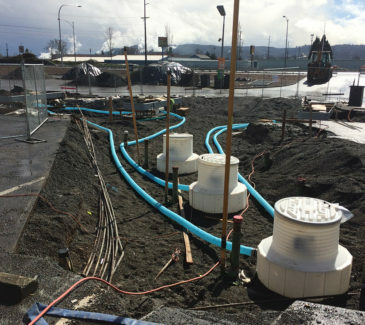 AEC supplied and installed a 660CPS oil-water separator, as required by the City, and installed five (5), 24” x 24” x 30” deep catch basins, connecting to the existing storm drain and sanitary piping.